Welcome to episode 28 of Data Viz Today. Is it ever beneficial to stray from the usual chart types and create your own original, novel data visualization? i.e. A viz where you decide what each free-form shape, line, and color represents. In this episode, host Alli Torban explores how this technique can lead to a deeper connection with your data. Featured data visualization by Sonja Kuijpers perfectly illustrates how creating an original visualization can turn overwhelm into clarity. 00:30 - Today’s episode is about how to build a connection with your data by creating original visualizations. And by original, I mean something that’s out of the typical chart type (bar chart, line chart, scatter plot), where you decide what each shape, line, and color represents and build a visualization from it that represents some dataset that you have. 01:20 - Sonja is an information graphics designer who runs her own company called Studio Terp based in the Netherlands. 01:35 - Her viz Keuzestress was a personal project of hers, translated from Dutch it means Choice Stress. 01:45 - Sonja was searching for a mascara that fit her needs, but soon found out that the there’s an overwhelming number of decisions that you need to make in order to choose a mascara - add length, add volume, add curl, or how about all three? How can she pick one? 02:10 - Well, since she’s an information designer, she decided to create a viz out of all the information. 02:20 - She scraped the data on all the mascaras that a Dutch makeup webshop supplied using Parsehub, which is a free web-scraping tool. And she cleaned it up in Excel. 02:50 - So she took the characteristics that she wanted to visualize and started drawing some forms that she felt fit for that characteristics, like a black circle to represent a black mascara and a thick grey ring to represent adding volume, and she put all the little shapes that she came up with and put them on top of each other and then she realized that all the shapes together actually looked kind of like an “eye”. 04:00 - Then she was finally able to give her mascara anxiety a little bit of order and put each one in its place amongst the others. She identified the couple of specifications that she wanted and was able to put her finger on the exact one she wanted. The final viz was created using Adobe Illustrator. 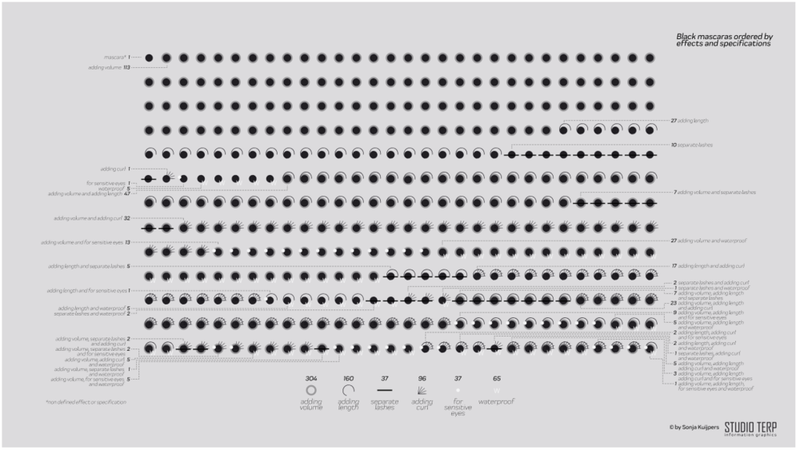 04:55 - By putting the mascara choices into a custom-styled data viz, she was able to take something that was giving her anxiety and turn it into something more tangible that she could sort, order, and connect with. 05:35 - Sonja’s project reminded me Giorgia Lupi and Stefanie Posavec’s Dear Data project where they hand-drew visualizations of little things in their life like how many times they checked the time during the day. 05:50 - Giorgia has a wonderful TED talk where she talks about this project and how when she explored her reality and visualized it with these hand-drawn visualizations, she was able to transform the abstract and uncountable into something that can be seen and felt, and it helped her feel more connected to her life. By handcrafting visualizations of information, she tries to re-connect numbers to what they stand for: stories, people, ideas. What she called data humanism. 07:40 - My inspired viz used the data visualization survey results from Elijah Meeks. 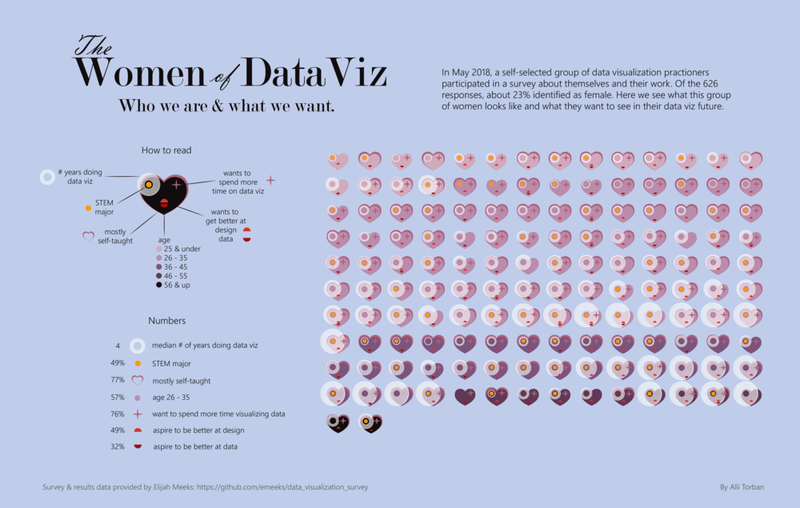 08:15 - Goal: feel a connection to my fellow data vizzers, specifically other women in the field. Listen for my process! 10:00 - It was a really tedious process arranging every single shape to put together each of the 142 women who took the survey. But it was also really cool because it allowed me to feel really connected to each one, like I found my heart and I could see the women next to me who are similar age, similar experience, does she have a STEM major, was she self-taught, is she interested in learning more design? 10:40 - My final takeaway is that by creating a custom, free-form visualization of your data, you can create something that’s not only beautiful and engaging, but also something that helps you connect with your data - like in my women in data viz project or help you quantify something that feels overwhelming to you like in Sonja’s project. If we can visualize data in an unrestricted way, it can open us up to appreciating our imperfect and intricate realities in a beautiful and meaningful way. So try freeing yourself of chart types, and see if you can connect with your data through this visualization technique. You can keep up with all her work on her website and follow her on Twitter!